Home > Products > Tropic Thunder! Heat of Battle brought guest designer Derek Ward into the fold with Tropic Thunder! (Heat of Battle will never tire of exclamation marks in the titles of their products). Tropic Thunder! 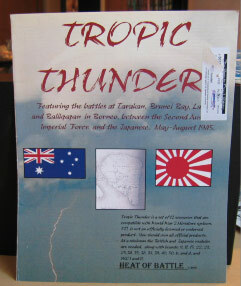 (TT) is a themed scenario pack; the scenarios all revolve around the Australian campaigns in Borneo in the waning months of the war in the Pacific. Strategically, this and other late war Australian campaigns were needless and wasted numerous Australian lives, but national pride drove Australian General Thomas Blamey to fight them, and MacArthur also supported the Balikpapan landing on Borneo. However, though strategically they may have been meaningless, tactically they offer many interesting situations for the ASLer, and these situations are what Derek Ward exploited. The twelve scenarios range in size from very small to medium; there are no large scenarios. Three scenarios feature flame-throwing tanks, two have caves, one uses Night rules. One scenario uses the hill boards from Heat of Battle’s High Ground! scenario pack and another scenario, TT12 (Signal Hill), uses DASL boards. The Australians are on the attack in nine scenarios; the Japanese on the attack in the other three. PTO scenarios have a smaller starting audiences than East Front scenarios, and the Borneo actions are obscure for all but Australians (and perhaps even to them); as a result, TT is not the most played scenario pack in the ASL portfolio. However, it has a good reputation among those ASLers who have tried it. 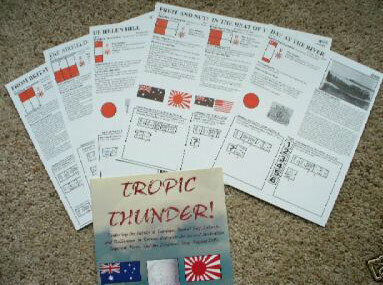 A good scenario to start with is TT6 (Fruit and Nuts), a short, quick moving scenario involving a Japanese attempt to annihilate a small Australian commando force. TT11 (From Britain to Borneo) uses maps HOB I and HOB II from High Ground!. PTO enthusiasts definitely should own this product and others ought to give it a chance. The ability to explore little known campaigns and actions is one of the best features ASL is able to offer.